Le Parker Meridien's Gingerbread Extravaganza! 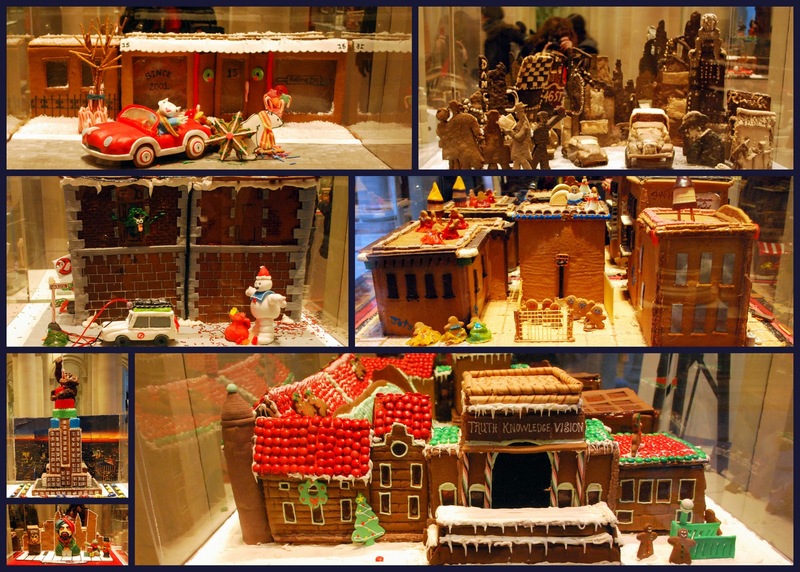 For the second year in a row the Le Parker Meridien Hotel, located at 119 West 56th Street in Manhattan, is hosting a free Gingerbread Extravaganza showcase in their lobby atrium. On display from December 1, 2010 until January 9th, 2011, the creations were all created by local bakeries, a food truck and restaurants. The theme chosen this year was "Movies Made in New York." I blogged about last year's wonderfully creative exhibit, which you can see at this link, and I knew I had to see this year's efforts. Notice the dinosaurs on the top floor of the museum! The iconic Kong holding a gingerbread Fay Wray in his arms on top of the Empire State Building! It has Tony and Maria dancing on the roof! Do you remember "Zoltar," the fortune teller machine in the movie? Such a cute Stuart Little! It contained lots of wonderful NYC scenes! For only $1 visitors can vote on their favorite gingerbread creation, with the proceeds donated to City Harvest, the food rescue organization dedicated to feeding the city's hungry men, women and children. In addition to spreading holiday cheer, if you buy a ticket to vote, your generosity is rewarded with a chance to win a 5 night stay at the luxurious Parker Palm Springs to be determined by a random drawing! creation would you vote for? 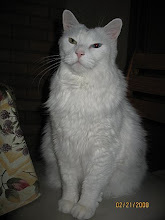 As New Year's Eve approaches I'd like to thank all of my blog readers and followers for your friendship and support! I can't believe I will be entering my fourth year of blogging! It has been very fulfilling to me to be able to take you along on my jaunts around the boroughs of New York City and the other places I've traveled in the past few years. Blogging has enriched my life very much, both through the research I do for my blog and by reading all of your wonderful blogs. 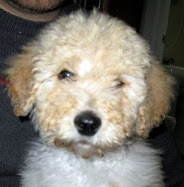 I look forward to a new year and I wish you all a very happy, healthy and peaceful 2011! I'm adding this post to Michael's blog Designs by Gollum "Foodie Friday," Sandi of The Whistlestop Cafe Cooking "Friday Favorites Linky Party, Cindy of My Romantic Home "Show and Tell Friday," Laurie of Bargain Hunting and Chatting with Laurie for A Few of my Favorite Things-Saturday, and Beverly of How Sweet the Sound for Pink Sunday! Thank you to all the gracious hostesses of these events for allowing us to share in all the fun! Macy's Herald Square -- the world's largest department store -- is located at 151 West 34th Street. The Macy's Herald Square store was lit up at every angle, and all the ground floor windows had beautiful holiday displays. This year's store windows on the Broadway side were based on a "Yes, Virginia" theme. "Yes, Virginia " is the classic newspaper editorial from 1897, written by New York Sun editor Francis P. Church in response to a letter from Virginia O'Hanlon, an earnest 8-year-old who wanted to know if Santa Claus existed. Church's insightful, kind and timeless editorial words never fail to bring a tear to my eye. You can read the editorial on this link. 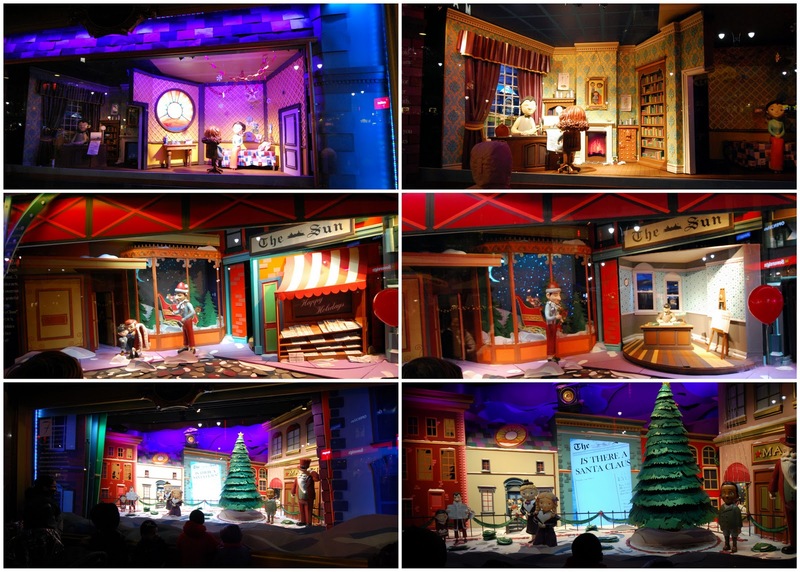 The animated sets at Macy’s are made entirely of paper! For 35 weeks (including 3,500 hours of design time) a small army of artists, carpentiers, engineers, and animation experts worked to bring the windows to life. 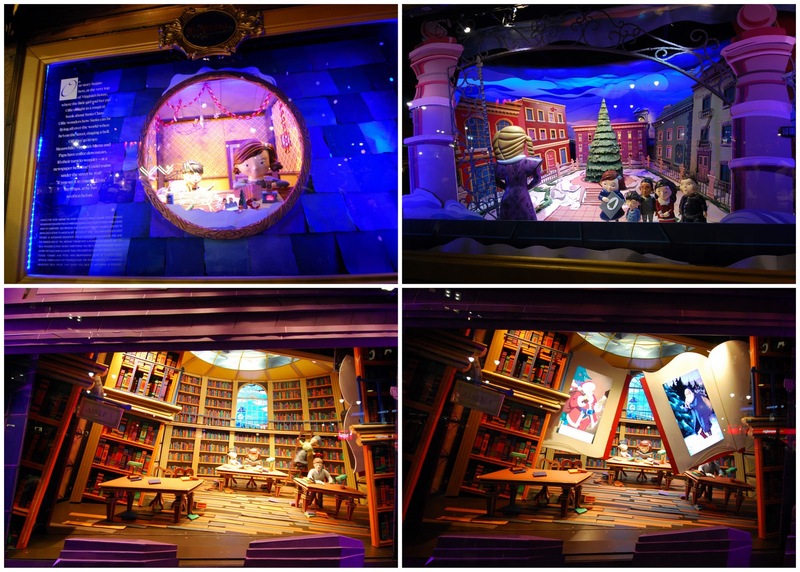 More than 1700 sheets of paper in 100 different colors and 25 gallons of glue were used by fourteen paper artists in over 7,000 hours of work to make every magical detail in the windows! downstairs her mama and papa drink coffee and read the paper. It's their turn to ponder - a newspaper headline! Can it be real? "If you see it in the Sun, it's so," says Papa, as he's said so often before. Virginia and her friends gather in a nearby courtyard. They admire her Santa book, happily recalling what Santa brought at Christmases past. "Grow up," sneers Charlotte, an older girl with a worldly air. "You can't prove he's real. Face it, Virginia. There is no Santa." The children's belief dwindles at these harsh words, but Virginia has something else in mind. To the library the friends go for proof Santa exists. With the help of the kindly librarian, they discover that, whether called Father Christmas, Cinter Klas, Bellsnickle, Kris Kringle or just plain Chimney John, Santa is beloved the world over. And yet... still no proof. Poor Virginia! "But," asks the librarian, "if he doesn't exist, why do children everywhere believe in him?" Why indeed? Maybe Papa knows! His logic isn't convincing, but the newspaper on his desk reminds Virginia of his oft-repeated words: "If it's in The Sun, it's so." That's when Virginia writes the letter that's become nearly as famous as Santa. And she waits...and waits...for a response. Worried for her little girl, her mother says, "Believing in Santa isn't something you prove. It's something you do. When you're kind to others, that's all the proof you need." Virginia ponders. Could it be true? Still pondering, Virginia encounters a scraggly, shivering "Santa" collecting coins for charity. The poor soul gave away his coat to someone in need! Recalling her mother's words about being kind to others ("That makes Santa real. . ."), Virginia returns with a new, warm and cozy red overcoat. Deeply touched, the grateful man tells Virginia, "Today, YOU'RE Santa Claus. Meanwhile at THE SUN, the editor contemplates little Virginia's letter. How to respond? Finally, the proof is printed in black and white, to be read all over! "Yes, Virginia," proclaims THE SUN. "There is a Santa Claus. He exists as certainly as love, generosity and devotion exist." A thousand years from now, nay, ten times ten thousand years from now, he will continue to make glad the heart of childhood." All is well and joyous in the world, and belief reaches higher and deeper and wider than ever before! But wait. Who is that portly, bearded gent in red, with a twinkle in his eye? This is a video I took of the library scene, so that you can also see the way the windows are animated and have narration. Come back Friday as I'll show you this year's fabulous Gingerbread exhibit and contest at the Le Parker Meridien Hotel. The theme for the gingerbread creations was "Movies made in New York City"
Linking this post to Outdoor Wednesday at Susan's blog A Southern Daydreamer. Thanks Susan! This is how my husband spent yesterday.....digging out from over two feet of snow that we received overnight the day before. The snow drifts were as high as three feet in some places as high winds also accompanied the storm. New York City's response to snowstorms is usually quite excellent, and the Department of Sanitation begins plowing and salting the street immediately, but for some reason the response to this storm was very poor and as of today many of the streets have not been plowed at all. Neither my husband nor my daughter were able to take mass transit to work the past two days as there were no buses or trains running in both of our neighborhoods in Brooklyn, either yesterday or today. Totally unacceptable, as far as we are concerned! Luckily my husband's boss was understanding, sadly for my daughter, her boss was not. Her boss, who lives in Manhattan and was easily able to travel to mid-town where the office is located, has no idea how impossible travel can be when mass transit is not working in the outer boroughs and the streets have not been plowed. Walls of snow! Imagine having to walk over these mounds of snow just to cross the street? 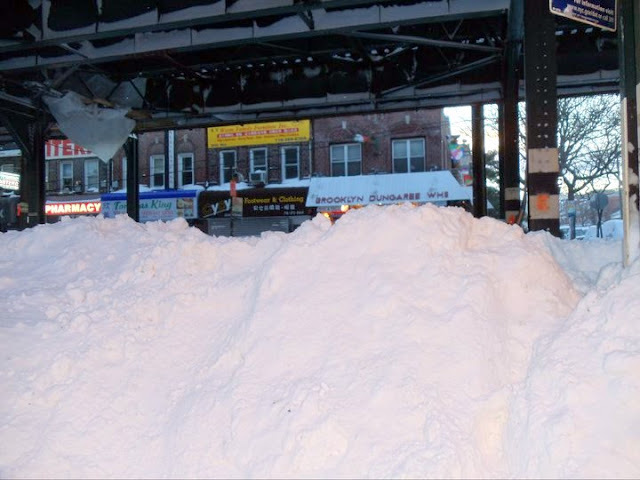 The stairs to the subway platforms were also covered with snow. It certainly has been a challenge to deal with all of this the past few days but at least we've had electricity and heat and have been safely at home. Thanks for all those who e-mailed me to ask if we were OK! It could have been a lot worse. What a way to end 2010! Every fifteen minutes in the evening there is a spectacular holiday light show that brings the building to life with music, bubbles and snowflakes! Called "The Snowflake and the Bubble," the 3D light projection show on the outside of the department store is absolutely amazing! The show tells a festive tale of how Snowflakes and Bubbles struggle to live in harmony, before eventually coming together in the spirit of the holiday season. You can watch the entire two minute show on this high quality video -- don't miss it! Wasn't that beautiful? The light show and original music will run for six weeks, until January 6th, 2010. As you can see in the photo above, Saks front windows are also specially decorated for the holidays, and crowds of New Yorkers and tourists line up to walk by them and enjoy their displays. 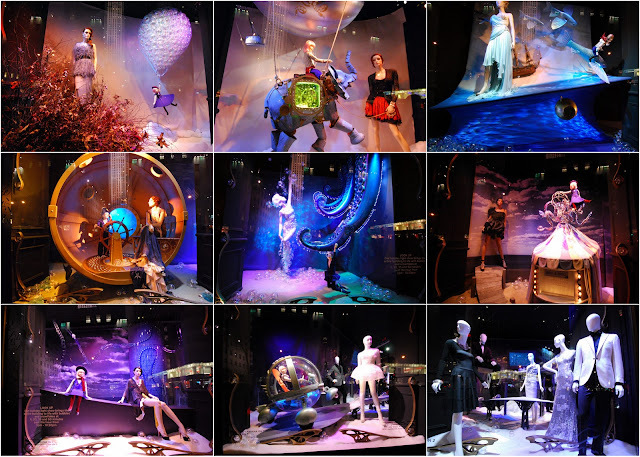 Saks estimates nearly a million people a day will walk by the holiday windows this season, versus the 400,000 to 500,000 that walk by on a regular day. I visited them both day (photo above) and in the evening, but the evening windows were easier to see as there were less reflections from the street. The theme this year is that of a little girl named Annabelle, who is seen above blowing bubbles, who has a dream inspired by the objects that are in the cabinet behind her. Her dream magically comes to life! The photo mosaics above and below show the progression of the dream in each of the store windows. There is something in motion in almost every window -- you can watch some of the animation and learn more about the dispaly on this link. 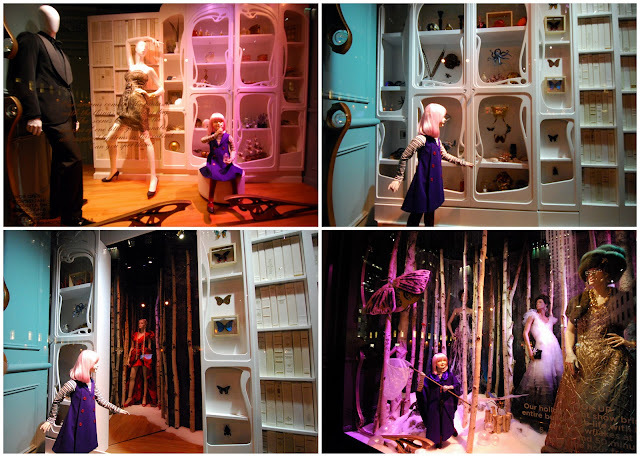 As you can see, many of Annabelle's magical dream sequences contain both the objects that were in the cabinet behind her in the first photo, and also bubbles, and one of a kind fashions by Proenza Schouler, Oscar de la Renta and Alexander McQueen. A equally spectacular sight is directly across the street from Saks, as there in the distance was the Rockefeller Christmas tree! If you haven't seen my blog post about this beautiful tree as yet, click here to read more. My next post will show the very colorful Macy's of Herald Square's holiday store windows and some more sights of Christmas in New York so please come back soon! This is the large, almost life size Nativity creche in Saint Patrick's Cathedral on 5th Ave & 50th Street in Manhattan. Today a statue of baby Jesus would be lying in the manger, as Christians world wide celebrates His birth! to be taxed with Mary his espoused wife being great with child. And so it was that while they were there the days were accomplished that she should be delivered. clothes and laid him in a manger because there was no room for them in the inn." From my house to yours, a very Merry Christmas! 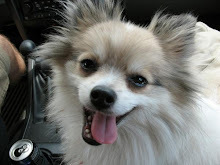 My blog comments are turned off today --- enjoy the holiday! Please return on Monday where I'll be showing many of the wonderful Manhattan department store holiday window displays! The 2010 Rockefeller Center Christmas Tree! The Rockefeller Center Christmas Tree, located at Rockefeller Plaza, between West 48th and West 51st Streets and 5th and 6th Avenues, Manhattan is a world-wide symbol of the holidays in New York City. The tradition for a tree at this site began in 1931, when workmen put up a Christmas tree on a muddy Rockefeller Center construction site. The first formal Rockefeller Center Tree Lighting Ceremony was held in 1933, and the first national televised ceremony was in 1951 on the Kate Smith Show. The tree, traditionally a Norway Spruce, is illuminated by 30,000 environmentally friendly LED lights on five miles of wire, and crowned by a Swarovski crystal star. The Swarovski star was first placed on top of the tree in 2004, and is the largest star to ever grace the tree. It measures 9 1/2 feet in diameter and 1 1/2 feet deep, and is adorned with 25,000 crystals and one million facets. This year's tree is a 74 tall Norway spruce donated by Peter and Stephanie Acton from their backyard in Mahopac, in Putnam County, New York. Mr. Acton is a New York City firefighter. 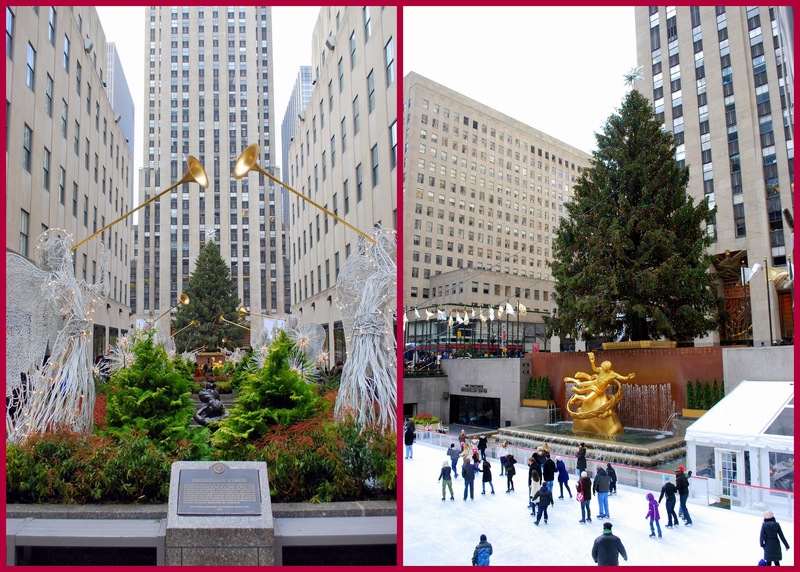 The tallest Rockefeller Center tree was 100 feet tall, in 1999. For me it isn't Christmas until I've seen the Rock tree and visited Saint Patrick's Cathedral which is located nearby across the street, on 5th Ave. On weekends the area is extremely crowded with visitors, so if you plan to visit NYC during the Christmas season, try to save your visit to the tree for a weekday evening. Some daytime views of the Rockefeller Center Christmas tree. The tree may be viewed 24 hours a day, but is the most glorious when lit. The ice skating rink is open from morning till night, but expect a line, as only 150 skaters can skate at one time. It's an incredible experience! I thought you'd enjoy seeing a video of the sights and sounds around the tree! Another video of the occasional blinking lights. Directly opposite from the Rockefeller Center is the Saks Fifth Avenue Department store. Every year their windows are decorated for Christmas, and they have a wonderful light and sound show projected on the outside of their building. I took movies of the show and I'll show photos and the movie next week, and also Macy's and Lord &Taylor's wonderful holiday windows! As Christmas quickly approaches I hope you have your shopping, decorating, wrapping, baking, etc completed. I've been busy doing all this past week, enjoying every minute. It really is the most wonderful time of the year! 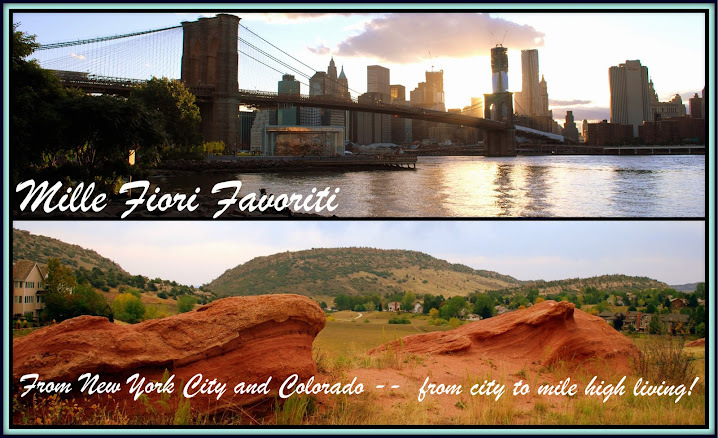 Linking this post to Outdoor Wednesday at A Southern Daydreamer -- thanks Susan! Also linking to Alpahbe Thursday over at Jenny's Matlock --the theme this week is "Christmas Blessings." --thanks Jenny! 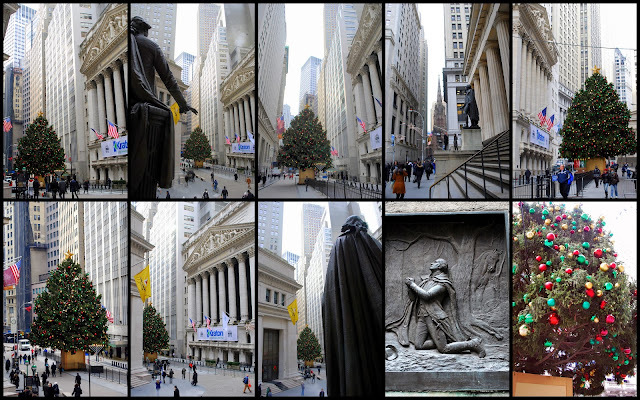 I showed the NYSE last year, all lit up at night, at this link. 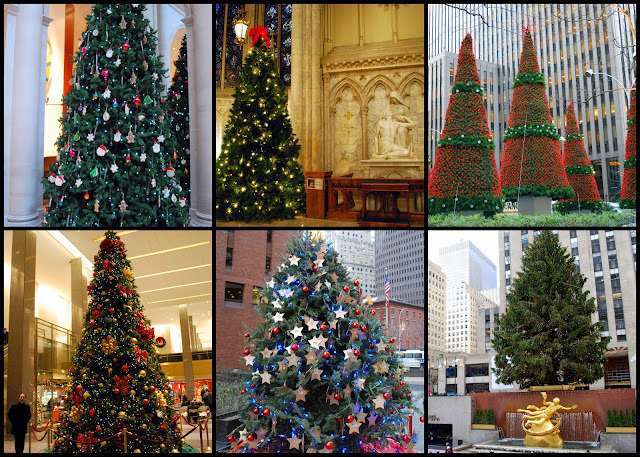 It is one of my favorite Christmas trees in New York. I love that the statue of our first president, George Washington, on the steps of Federal Hall is looking down at the tree each year. From some angles it almost looks like he is reaching out to touch the tree! 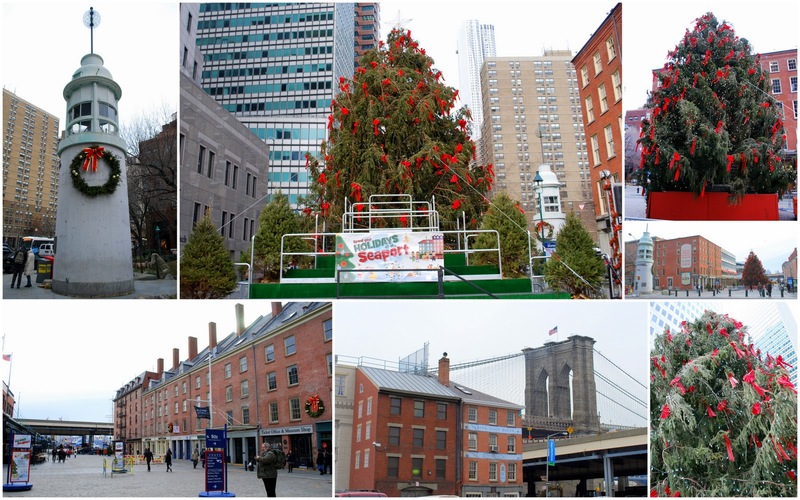 Another tree in Lower Manhattan is the South Street Seaport Christmas tree. It is sometimes referred to as the "Singing Tree" as the seaport schedules many choral productions in front of the tree throughout the holiday season. This year's Seaport tree was 50 feet tall but lost about 10 feet in height when the base snapped off during a wind storm that hit new York City in the beginning of December. The tree toppled over, but was salvaged and was able to be returned to its base again. There are many beautiful trees throughout the city. Top left is the tree at the Le Parker Meridian Hotel, top middle is the Christmas tree inside Saint Patrick's Cathedral, top right are Christmas trees made of lights in front of the News Corporation building on 6th Ave. The bottom left tree is located in the lobby of The MetLife building, the middle tree is one of three on the Vietnam Memorial Plaza, and the last is the famous Rockefeller Center tree...I'll be showing much more of that on my blog on Wednesday, including a video I took at night when the tree was ablaze with lights and so beautiful! 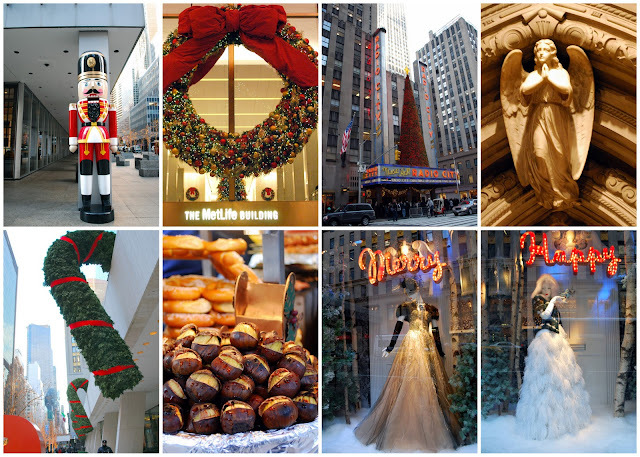 New York is certainly a festive place to be for the Christmas and New Year's holiday! The buildings are are decorated, the store windows glisten with beautiful displays, chestnuts are roasting in the street vendors carts and there are many shows and events to see throughout the month that bring the holidays alive. And you never know who you might meet on the street! I have lots more to show in the coming days! 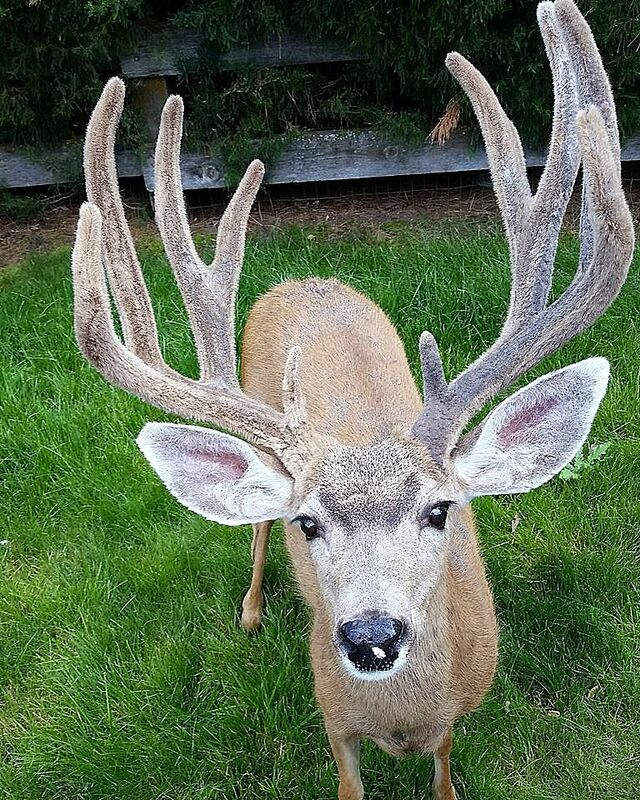 Please be sure to come back for a visit! I'm linking this post to Mary's Mosaic Monday at The Little Red House. Colorado's Capitol "Tree of Honor"